Rhenigidale Hostel – explore rugged mountains & haunting Loch Seaforth. A village at the end of the road, in a secluded bay with views over the Minch to Skye & NW Scotland. Once it could only be reached by sea or by footpath over the hills. It is still possible to walk along the old way from Urgha (east of Tarbert). This includes a descent down the ‘Zigzags’, twelve loops which take you to sea level at Loch Trolamaraig. The hostel is the white building standing above the road on the east side of the valley. The warden is Kate Langley. 12 Beds in three shared rooms. Two dormitories of five beds. One dormitory of two beds. Charges 2018. From 1 April 2018, an individual bednight fee is £16 for age 18 and over, under 18 the fee is £8. The individual camping fee is £10 which reduces to £5 for those under 18. If you wish to hire a sheet sleeping bag the cost is £2. The hostels are not available for “Day Use” except where a bednight or camping fee is paid. To download our information sheet for the charges operating in 2018 please click here. Camping is possible within the hostel grounds. There are three prepared pitches, but they are all small. There is no room at Rhenigidale for large “family tents”. There is also no space on the hostel property for campervans. Wherever you camp, the camping fee is payable if you wish to use the hostel facilities. Visitor parking and animals, other than Guide Dogs, are not allowed within hostel grounds. No advanced bookings can be taken so we are unable to forecast future availability. See our Frequently Asked Questions page for more information. Commended by Trip Advisor and now rated as a two-star hostel by Visit Scotland due to “recent investment and improvements”. Common Room: A cosy room with comfortable furniture and a multi-fuel stove. Kitchen: Fully equipped modern kitchen with cooker, fridge, microwave ovens, food storage boxes, crockery, cutlery, cooking equipment, tea towels, dining table and chairs. Recently improved. Toilet and Shower: Separate rooms with instant hot water units. External toilet which also doubles as a drying room on wet days. Dry days, there is a washing line in the hostel grounds! Beds – bunk beds in three shared rooms. 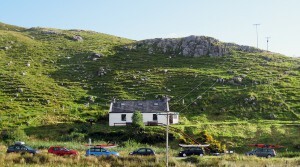 Rhenigidale can be approached from the north-east by road (13 miles from Tarbert). From the A859, Tarbert to Stornoway road, take the narrow road signposted to ‘Maaruig’. This is on the side of Clisham, the highest mountain of Harris (2622 ft). The narrow road descends into a valley for half a mile. After a hairpin bend, there is another junction, with a phone box on the corner. Turn right and continue the four miles to the road-end at Rhenigidale. The alternative route, on foot, is arduous but gives magnificent views on a clear day (6 miles from Tarbert). From Tarbert take the road towards Kyles Scalpay for two miles. Just beyond Laxdale Lochs (Grid Ref: NB185005), at a bend in the road, the track turns off to the left across the hills. There is a signpost to Rhenigidale. The track is marked on OS maps. The four miles of the footpath walk is along a clearly-defined path which passes over the south-east shoulder of Trolamul. The footpath is unsuitable for cycles. The path looks cyclable for the first mile or so from Urgha, but deteriorates just after the summit near the junction with the path to Molinginish. Do not take the signposted turn for Molinginish if you want to walk directly to Rhenigidale. Shortly after the fork the track zigzags steeply with 12 hairpin bends down 850 ft to Loch Trolamaraig and then follows the coast to Rhenigidale. It joins the road just west of the village. Walkers should not attempt the track after dark. Accordingly leave sufficient time to complete the track before sunset. At least two hours walking time should be allowed, more if you are unsure of the way or are an inexperienced walker. An account of this walk in reverse, from Rhenigidale to Tarbert, appeared in The Independent. Nearest bus stop: 20 yards from hostel. (No stop but you can’t miss the bus. Usually it is a minibus.) It is essential that you phone beforehand. The bus takes nearly a dozen school children to & from Tarbert. The morning bus gets you to the bus shelter at the junction with the Tarbert to Stornoway road in time for you to catch the morning bus to Stornoway. There are bus connections at Tarbert for travel to or from Leverburgh, where you connect with the ferry to Berneray. For public transport information visit the links to the main operators on this website. Shops, petrol pumps & Post Office at Tarbert. (13 miles) Also a shop and petrol pumps at Aird Asaig on A859 road (Tarbert to Stornoway road) 10 miles from the hostel. These are the nearest shops. It is essential that hostellers bring all necessary supplies to the hostel. Taxi hire is possible. Harris Taxis in Tarbert are the nearest taxi firm. Their number is 07500 450387. Toddun (1782 ft) stands adjacent to the village and can be climbed by a variety of routes from Rhenigidale. The sea entrance to Loch Seaforth (a fjord) is adjacent to the village. It is a short walk over the hill behind the hostel. A haunting place where you can watch the jellyfish float along, and wonder at the sheer walls of the hills rising direct out of the water. Kenny Mackay has published a book describing the developments at Rhenigidale during his lifetime, events in which he took a leading role. According to the publisher. The fascinating story of one community’s fight for survival. The village of Rhenigidale was cut off for many years from the rest of Harris, in the Western Isles of Scotland. Facing a multitude of obstacles and powerful adversity, one man, Kenneth MacKay, led the fight for a road to be built, to secure the future of his village. 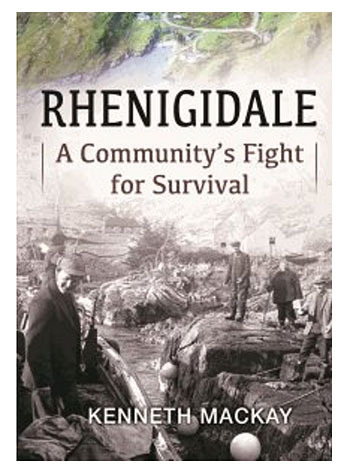 This remarkable story – the daily troubles the village endured, the constant fight with the council, and, finally, the victorious day the road was opened – is sure to be a great read.